The decision to attend wedding planner school before you start a wedding planning business or begin searching for a wedding planning job is a very personal one. Not everyone will be at the same stage in their careers and your set of financial, social, and mental circumstances won’t be exactly the same as anyone else. You might think to yourself, “Well, of course I need to go to wedding planning school! How else will I survive?” These kinds of thoughts are normal, but the fact is the wedding planner school is not for everyone. How much applicable experience and education do I already have? Do I have the time and money to go to school before I begin working in the field? Will my competition have attended wedding planner school? Once you have answered those questions, it’s time to start digging into the specifics of this important decision. If you already have a background in floral design, photography, videography or another vendor related wedding field, then you have a big reason to smile: you have come into the wedding planning business with a huge advantage over your competitors. The more weddings you have attended as a vendor, regardless of what your role was, then the more deeply you understand the wedding industry. The truth is that all vendors–from the florist to the DJ–have learned how to manage their clients, who are in a situation they have probably never practiced for and will probably never encounter again. If you already have prior experience as a business-owner, you already have a huge advantage. We all learn from our mistakes as well as the mistakes of others, so if you have some experience attending weddings, you have seen plenty of vendor mistakes or at least some situations you now know to handle differently because you witnessed someone else’s experience. On top of that, the more weddings you have attended the more variations you’ve seen–different styles of ceremonies, décor, room layouts, food, music, etc. Right off the bat, this gives you a wider breadth of information to draw from and share with your brides, even with no prior wedding planning experience. It makes you ready to address problems when they occur and more familiar with all the details that need to be handled on the day of a wedding. Even if you have owned a business in an unrelated field, this also counts as a head start. Any reputable wedding planner school will teach their students the basics of marketing, advertising, managing, and bookkeeping, but with your prior experience as a business-owner, you’ve already got most of that covered. Here’s the point: if you already have prior business experience (on an executive level) and/or some experience in the wedding industry (as a vendor), you may not need to attend wedding planner school. This is not to say that you shouldn’t attend, but rather that you may already possess the primary skills and information that wedding planning schools will cover. As such, you might be able to save your money and instead opt to first get hired by an existing wedding planning company and work your way up. Needless to say, if you are choosing wedding planning as a career choice upon high school graduation then taking some level of professional wedding planning courses would definitely be the next step for you! And luckily for you, becoming a certified wedding planner is much less labor intensive and capital intensive than most other professions. The Wedding Planning Institute offers not only a Wedding Planning Certification Course but also an Event and Wedding Design Course, Floral Design Courses, Certified Green Wedding Design Course and Certified Wedding and Event Instructor Course. Another option would be to attend a local technical or community college and take hospitality and culinary arts courses while also attending wedding planning school. This would expand your career opportunities since many resorts and hotels expect their wedding/event planning staff to also work with their clients on menu selection. In fact, event/wedding planning positions are often categorized under hospitality or food and beverage when it comes to hiring. If you plan to practice in a competitive market such as New York, Boston, or L.A., attending wedding planner school is crucial. For those readers who are contemplating attending wedding planner school and who have no prior experience, consider this: your clients are just like you. They are regular people who probably don’t have unlimited budgets, and so they’re going to do their research before they decide on who is going to plan the most important day of their young lives. They’re going to want to know who you are and what your background is. They will begin with online research comparing numerous wedding planners event photos, bios and their credentials. When you get a spare moment, do a quick search for local wedding planners in your area, and click on their bios. 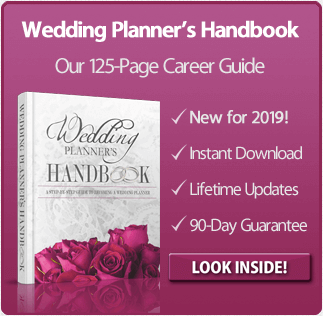 If they have been to wedding planner school, you can bet they will wisely market themselves as “Certified Wedding Planners,” since the completion of any wedding planner school is going to include Wedding Planner Certification. Your prospective clients are going to see this, too. What do you want them to see when they click on your bio? If the answer to that question is a proper wedding planning certification from an accredited wedding planner school, then you’ll want to read our overview of the Top 3 wedding planner courses available and compare their different features and pricing options. For now, we’ll offer a brief overview of two schools to give you an idea of what wedding planner school is all about. What is Wedding Planner School Like? There are numerous options for attending wedding planner school–none of which take more than a few months or cost more than $1,500. This is a paltry sum compared to what you’d need to spend achieving an MBA or doctorate degree! One fine example of an accredited wedding planner school is the Penn Foster Career School. Penn Foster is approved by the Association of Bridal Consultants and is an online program which can be done at your own pace. The cost of this program is $609-$799 depending on whether you pay in installments or in advance. Another school that is also approved by the Association of Bridal Consultants is the Wedding Planning Institute. They offer a variety of methods to obtain wedding planner certification and you can attend in a classroom setting at many local community colleges across the United States. These courses usually last approximately three months and many times even include an internship. WPI also offers an online course which costs $999-$1,500 depending on your choice of payment options and a self study option using workbooks which costs only $595 if paid in full. Both the Penn Foster and the Wedding Planning Institute’s courses include the arranging, organizing and conducting of the various events leading up to the wedding as well as the wedding ceremony and reception itself. They also include the customs and traditions of different ethnic, religious and military ceremonies. 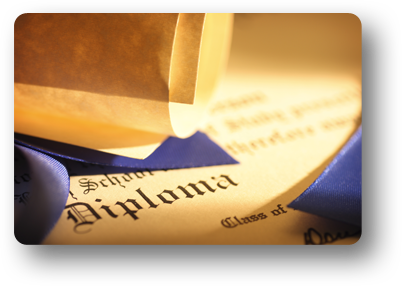 One of the most important areas both of these schools cover that many of the other less expensive schools do not are the business skills you’ll need to run your wedding planning company. You may know how to plan a wedding with your eyes closed, but if you can’t find a steady stream of paying clients or know how to effectively reinvest your profit back into your business, your company will struggle in spite of your skills. Upon completion of these courses you will have business templates, contracts, fee structures and business plans that will help jump start your wedding planning business. Top tier wedding planning schools are indeed the full package. So, is wedding planner school a necessity? Absolutely not. Is wedding planner school a huge benefit from a personal and business perspective? Absolutely. If you feel that you cannot afford attending school (especially after having to carry the financial burden of a four-year college education), you are not alone. Just know that you might need to work a bit harder to get your foot in the door. The wedding planning industry is a competitive one, but it is also growing at a magnificent rate, and it’s never been a better time to get started! Previous post: What Does a Wedding Planner Do? Next post: How Much Do Wedding Planners Charge?